–Did you feel the earthquake? Just to the east, Bronson Canyon has a similar geologic makeup, with a dramatic difference: until 1929, the north end of the Canyon was a productive quarry called the Union Rock Company. Now popularly known as the Bat Cave because of its appearance in the old “Batman” TV show, the quarry supplied all the granite for Hollywoodland’s public retaining walls, stone gates and stairs, as well as the walls, chimneys and walkways of its houses. My first inkling of my new home’s underpinnings came during escrow, when I met the engineer who supplied the requisite site report. “Because of where you are, you really don’t have to worry about movement,” he said. He wasn’t kidding. I later learned that in 1994, a post-Northridge Earthquake survey of Beachwood Canyon houses–which number in the hundreds–turned up no damage at all. At the time of the Northridge Earthquake, I lived in Hancock Park, which lies on the floodplain of the Los Angeles River. Hancock Park stands on clay, and the neighborhood shook violently that night. Power lines, brick walls and chimneys fell. Although the extent of the structural damage to my house there wasn’t apparent at first, a low crack in my chimney called for it to be replaced; when it came down, the house started to collapse. Long-term termite damage was exacerbated by the quake, and the house had to be completely reframed. None of the work was covered by FEMA. After that nightmare, I was happy to move to a neighborhood that is the geologic opposite of Hancock Park, a place so solid you can feel it underfoot. 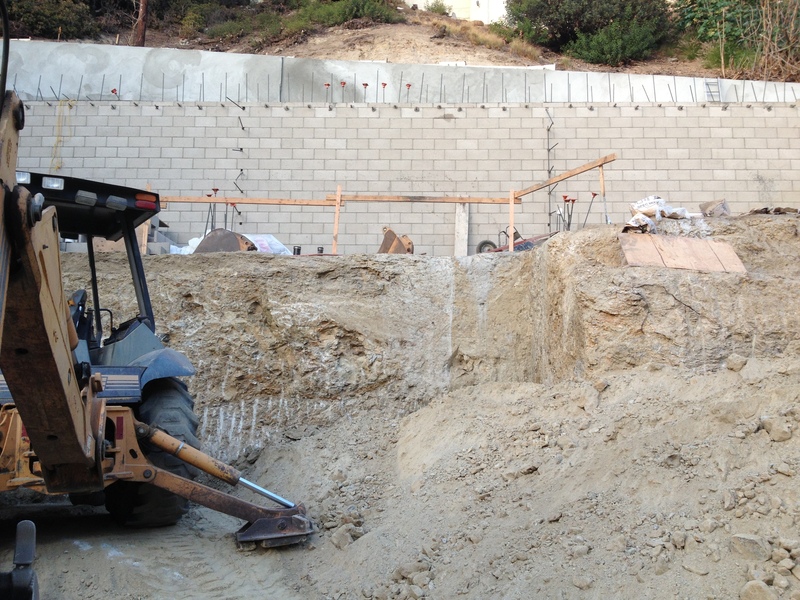 The photo–of a newly excavated hillside on Westshire Drive–shows the thick granite foundations on which Hollywoodland was built nearly ninety years ago. 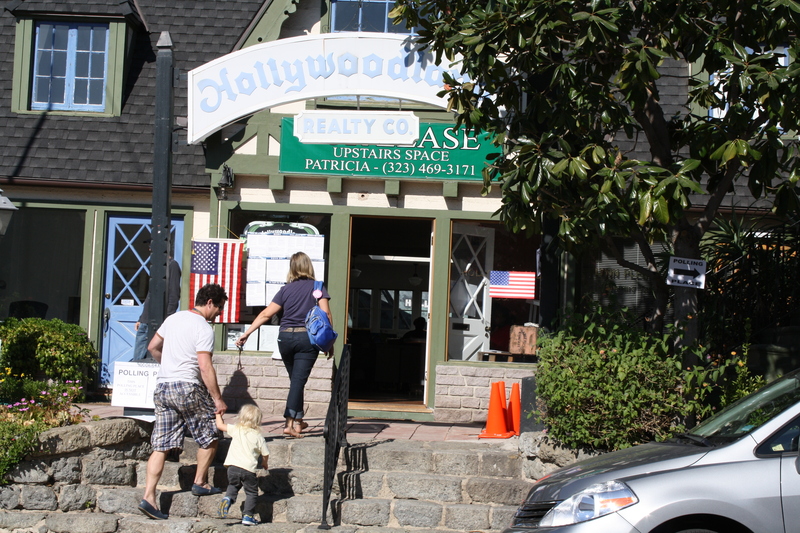 Like many residents of Beachwood Canyon, I’m lucky to have Hollywoodland Realty as my polling place. Located just inside the Hollywoodland Gates, the Realty office fulfills a community function that goes well beyond the business of real estate. It’s where we go to vote and have our documents notarized. Tourists stop by for directions. And last December, in celebration of a major renovation, Hollywoodland Realty hosted a Christmas party for the neighborhood. The first structure to be completed in Hollywoodland, it opened for business in early 1923. 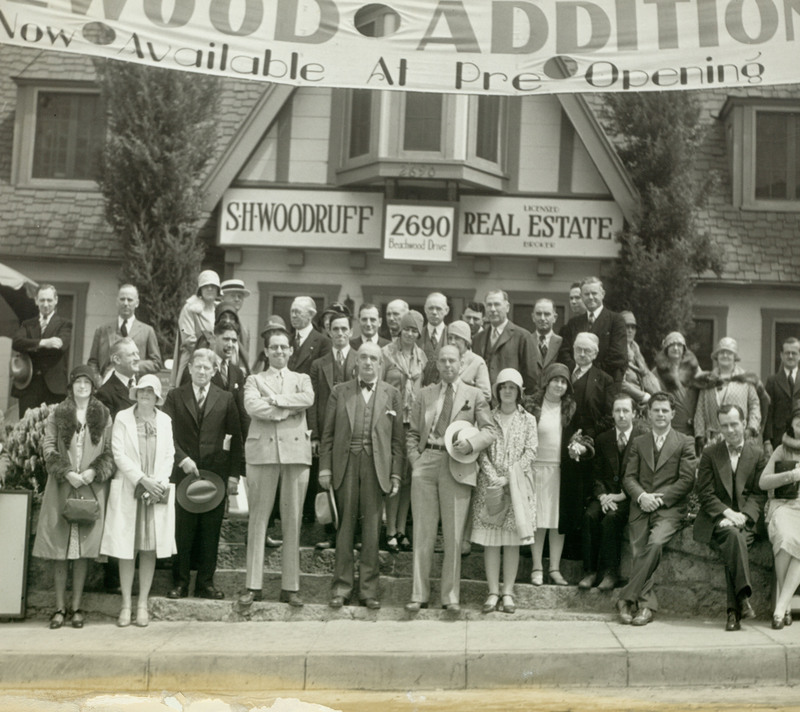 At first, Hollywoodland Realty sold lots to prospective home builders; afterwards, it sold and resold the houses that were built on them. For nearly 90 years, the Realty office has been the beating heart of the neighborhood, and the fact that it is our polling place helps to explain why. Today just after noon, on a day of heavy voter turnout, the wait was about 3 minutes–probably the longest I’ve experienced in seven years of voting here. The fact that many of us work at home helps stagger the voting throughout the day, so that the only really busy times are the first and last hours. But even if the line had been longer, waiting would have been a pleasure: meeting and talking to neighbors at Hollywoodland Realty connects us, not only to one another but to Hollywoodland’s past. There’s a great moment in “Argo” that shows the Hollywood Sign as it looked just before it was demolished and rebuilt: various letters have collapsed, and those that are still standing look as if they might crumble away at any moment. When I saw the film last week, audience members laughed at the shot, though I don’t know whether in shock or recognition. It wasn’t until days later that it occurred to me that the director, Ben Affleck, took significant liberties with the timeline. At the time of the Iran Hostage Crisis, which began on November 4, 1979, the Hollywood Sign–the same one being repainted today–was not only rebuilt but had stood for over a year. The old 1923 Sign began to be dismantled on August 8th, 1978. The new Sign was completed on October 30th, 1978. What makes the discrepancy odd is that Affleck has taken enormous pains to match, in shot after shot, his film with archival footage of the Iranian Revolution and the Hostage Crisis. In the end credits, stills from the movie appear alongside archival pictures of the hostages, the American Embassy and Tehran street scenes. The resemblances are astonishing. 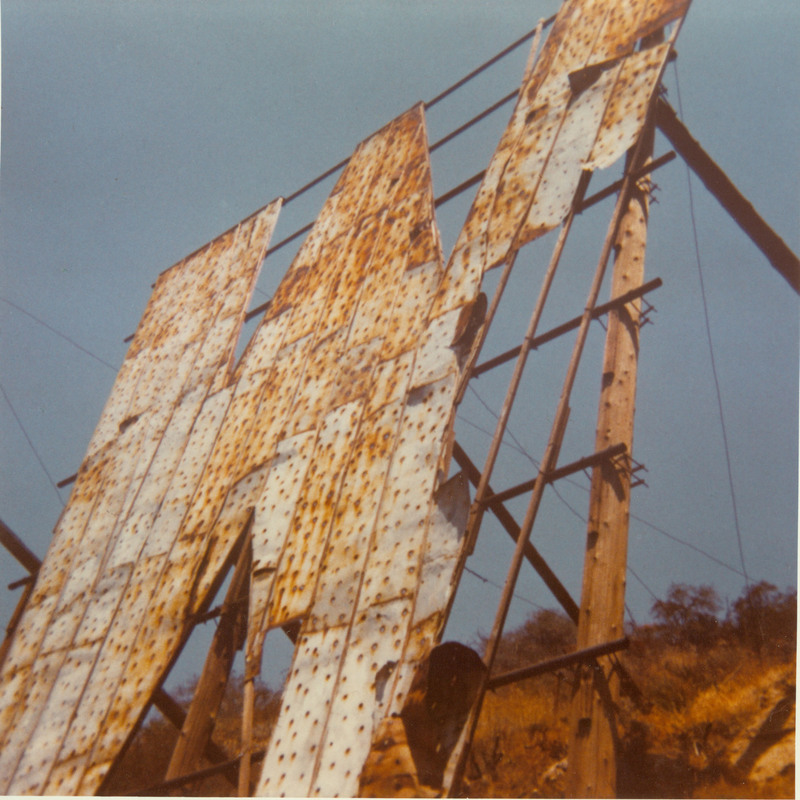 Naturally, a shot of the brand-new 1979 Hollywood Sign wouldn’t have had the visual impact of its pre-1978 decrepitude. But it seems strange that Affleck’s talent for cinematic verisimilitude didn’t extend to the Sign in this otherwise perfect time capsule. Postscript: After this piece was posted, a new Awards season trailer for “Argo” turned up on TV. It opens with a helicopter shot of the Hollywood Sign as it actually was in ’79–newly built and freshly painted. Coincidence? 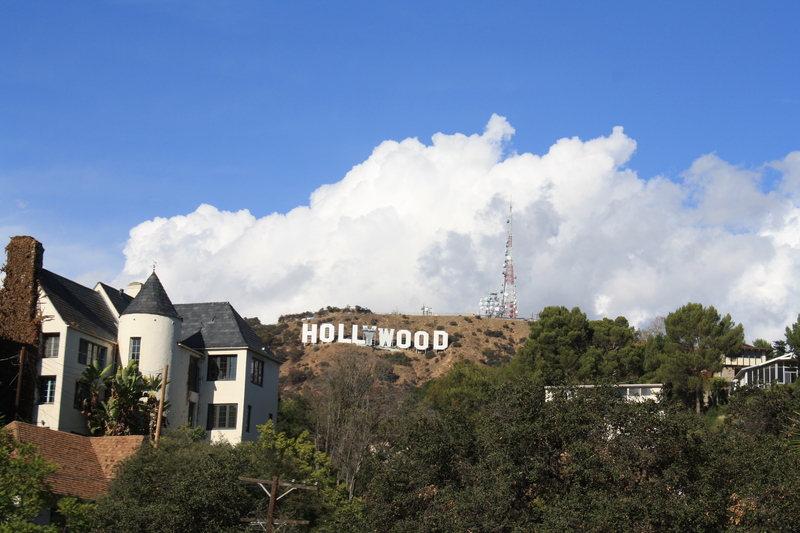 You are currently viewing the archives for November, 2012 at Under the Hollywood Sign.